Book Review. 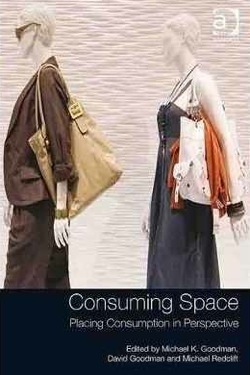 Consuming Space: Placing Consumption in Perspective edited by Michael K. Goodman, David Goodman & Michael Redclift. Ashgate, 2010. Chicken industry in UK, the violent history of luxury teak wood in Burma, boutique hotels in New York, chewing gum and the ‘tropical paradise’ of Cancun, seduction and commodity fetishism, ethical local and organic food, Chilean wine in UK, internet and consumption…Wondering what they have in common? The answer is: they are all amazingly catchy cases for developing a theory of consumption, production and the role of space – and they are all to be found in one edited volume - Consuming Space: Placing Consumption in Perspective. This edited volume is one of those in which one finds something new and valuable every time one returns to it. It is literally packed with both interesting facts and great theoretical insights. Even though most of the contributors work within the field of social geography, I believe that the volume contains many interesting perspectives for anthropologists. The focus of the volume is on understanding the ways in which we produce and consume space, as much as ways in which we produce and consume nature – the various case studies all relate to this topic. It looks at the space of social practice, which is “occupied by sensory phenomena, including products of imagination, such as projects and projections, symbols and utopias, which describe and contain consumption cultures” (xi). It looks at how space is made and remade along the trajectories of the social relations of production and consumption, in other words, this volume is an exploration into diverse contemporary capitalist political economies. I have selected several of the book chapters for the review. It is those chapters that I enjoyed reading the most and that also shed some light on the red thread that goes through the edited volume: the conceptualization of space in relation to consumption and production. Michael Redclift looks at the ways in which the histories of production and consumption are tied to histories of particular locations in his chapter Frontier Spaces of Production and Consumption: Surfaces, Appearances and Representations on the ‘Mayan Riviera’. He shows how a place, its nature and social relations were transformed first as a result of the emerging popularity of chewing gum and later on as a result of transforming this place into a globally popular tourist destination. He brings the reader to the Mexican Caribbean Coast and looks at its layered histories that point to the hybridization through which nature and society meet and refashion space. Redclift weaves together a narrative of chicle – the raw material from which chewing gum was derived – a story that transformed the landscape and ecology of the Yucatan peninsula of Mexico. He shows that “the boom of chicle production eventually gave way to other forms of production and consumption, notably in the development of international tourism on an altogether more ambitious scale” (86). He then goes on to tell the story of how Cancun, the ultimate tropical ‘artificial’ paradise, was created, how it emerged as a major touristic destination and how it lost its appeal in the 90s. This chapter shows the importance of setting the space which is consumed in a historical context. He reveals also how the “fortunes of New York are closely linked with those of the Mexican Caribbean, and those of the Caribbean are linked with generations of people elsewhere, especially in Europe and North America, whose daily life depend on connections that they were usually only dimly aware of” (94). The story that Redclift tells is complex and interesting and I encourage anyone with interest in Mexico, Caribbean or the workings of tourist industry, to look into it. In The Cultural Economy of the Boutique Hotel: The Case of the Schrager and W Hotels in New York, Donald McNeill and Kim McNamara deal with another kind of space, namely the ‘boutique hotel’. The ‘boutique hotel’ has been one of the biggest stories in the hotel industry since the 1980s and its popularity has spread worldwide. The chapter maps its cultural economy and the processes of the ‘economy of qualities’, where the boutique hotels are perceived as having a life, or a career. They show how the hotel’s lifecycle is “closely related to the specificities of local markets, the urban economic sectors that dominate central business districts, and the physical structure of existing buildings” (151) and thus how creation of particular spaces is always part of larger processes. They look in particular at the development of Ian Schrager’s boutique hotels in New York, which coincided with the transformation – from the 70s onwards – of the city into a fashion capital and the hub of music, art, design and disco-lit nightlife. This chapter nicely portrays the shifts in aesthetics and design as much as in consumer demands and the ways in which desires are manufactured. It also portrays how the boutique hotel concept was appropriated by competitors and boutique hotels suddenly emerged all around the globe. I have stayed in many boutique hotels in India and this chapter definitely sets them into perspective for me. In Manufacturing Meaning along the Chicken Supply Chain: Consumer Anxiety and Spaces of Production, Peter Jackson, Neil Ward and Polly Russell look at a different dimension of space. They analyze spaces of production in relation to consumption to understand how meaning is manufactured in this process. They reexamine the contemporary trends of re-connecting producers with consumers, where consumers increasingly wish to make qualified choices, where for instance – those with capital – prefer eggs from free roaming hens, or meat from small local producers. This chapter focuses on “identifying where and how the distinctive cultural meanings of food are created and negotiated” and it argues that “this process of ‘manufacturing meaning’ has direct economic consequences in a commercial climate where food is increasingly ‘sold with a story’” (164). They thus set out to explore “role of subjective ideas, like myth and memory, within contemporary understandings of food industry” (164). They map the terrain of the intensive (broiler) chicken industry, an industry which epitomizes the recent industrialization of agricultural production. The interesting question they ask is when and under what conditions chicken becomes perceived as either a sentient living being or as commodity - a question of the commodification of nature. They show how the “food producers are not simply manufacturing a product (broiler chicken) but they are also simultaneously attempting to manipulate the meanings which consumers attach to that product” (169). They approach this through life history interviews with people who have been for years involved in the chicken industry; some of these interviews are certainly interesting and point to the ambivalent relationships between these people and chickens, which are often understood in terms of profit, as a commodity, but still – a special type of commodity, a living commodity. These life histories show that “the ‘invisibility’ of chicken production has direct consequences for the way consumers relate to the product” (173) and that “the mechanization and acceleration of poultry production creates a distance from any emotional connection with live chickens intended for slaughter” (174). They argue that “in managing the risks associated with chicken production, (…) the food industry is faced with a number of tensions most readily apparent in the desire to justify premium prices through revealing more about animal welfare, quality and provenance without making consumers ‘squeamish’ by providing too much information” (184). According to them, consumer anxiety is “an inevitable consequence of the intensification of the industry, a direct result of the commodification of nature and the increasing distance separating consumers from producers” (184). In Consuming Burmese Teak: Anatomy of a Violent Luxury Resource, Raymond L. Bryant looks at how space as much as people’s lives have been transformed and even devastated by the desires of elites for luxury wood. This chapter brilliantly uncovers how the history of the premier world luxury wood – the teak tree – has been implicated in a history of violence, oppression, exploitation, and civil war. He shows the dark side of the story of this luxury commodity which nowadays adores the yachts of the wealthy. In Burma, “political interests centered on controlling teak forests and their inhabitants. Burma’s rulers – pre-colonial monarchs, British officials, post-colonial civilian and military elites – have all grappled with this problem, even as forest residents – shifting cultivators, villagers, timber traders – have sought to evade central control. In short, teak has been a perennial focus of struggle” (240). His version of the story of the teak is certainly not the ‘official one’. He calls the Burmese teak a blood timber – “a resource whose record of exploitation can be viewed as a bad thing” (240). The accounts he argues against in this chapter are those “written by and/or for elites”, accounts that “present one particular version of history that is ‘factual’ in tone, partial in scope and de-politicized in presentation” (240). In pre-colonial Burma teak tree was preferred by the Burmese royalty and nobility; it was used in ship-building and the 18th and 19th century were marked by a thriving export trade. “As a valued timber, there was a royal monopoly on teak from at least the eighteenth century that was enforced in the forests by specially appointed guards empowered to fine or arrest anyone involved in its illegal extraction” (241). The British in search for new timber supplies to build war ships discovered the potential of Burma, the home to the largest teak forests in the world. And so “from the mid-nineteenth century to the Japanese invasion of Burma in early 1942, the consolidation of British control went hand in hand with the elaboration of the world’s leading export-oriented teak industry. As such, teak became prime imperial resource” (242). Teak was shipped to markets in both Europe and British India, where it was used in everything from park benches, railway sleepers to warships. After 1900 the forests in Burma were ‘privatized’ and became dominated by foreign companies, a fact that generated considerable local resentment. “Official revenue earned from the lucrative teak industry was used to sustain the British Indian colonial administration (of which Burma was a part)” (243). “Even as teak wood contributed to imperial grandeur and post-imperial fine living by providing a marker of distinction for both the already well-to-do and the socially up-and-coming, it was also the focus of vicious strife in the forests from where it came. (…) Burmese teak extraction has been a brutal and tawdry tale of state repression, local displacement, popular fear and loathing, and out-and-out murder” (248). This story of production of teak, is a story of production “whose anatomy combines extinction and distinction in a way and to an extent that perhaps only violent luxury goods can do” (253). The last chapter which I have selected is – paradoxically – one of the introductory chapters. These chapters are all theoretically oriented and are definitely a must read. Yet one of them stands out in my view and that is The Seduction of Space by David B. Clarke. All the above case stories suggest the omnipresence of the commodity and the saturation of space with commodity. There is literally no escaping commodity and the market. In this situation, it is most appropriate to reexamine Marx’s notion of commodity fetishism, and that is what Clarke does in his chapter. This notion has become over time unpopular among many social scientists that tend to favor the idea of full consciousness of the consumer eliminating thus any traces of false consciousness. Yet Clarke shows that Marx is “undoubtedly far closer to acknowledging unconscious effects than many recent theorizations of consumption” (57). Taking this as a starting point he then goes on, using Lacan, to focus on the alignment of the pleasure principle and reality principle. In the final section he looks at the way in which “the reality principle and the pleasure principle have been deflected by their due alignment”, which manifests itself in the “deregulation of the reality principle and the consequent emergence of an unprincipled reality” (58). To reach to this point Clarke uses Baudrillard’s notion of seduction – seduction, and not consumption, is here opposed to production. Seduction diverts, takes aside, it is everywhere and at all times opposed to production. Clarke then argues that “fetishism has come to saturate social space in its entirety” (59), and looks at the shift from the scene of consumption to its obscenity, from the production of space to the overexposure of pornogeography. Clarke nicely shows through his chapter that “it is simply not the case that these polarized positions – either full consciousness or false consciousness – are the only alternatives on offer. Indeed the particular framing merely reproduces the terms of a longstanding idle debate – by beginning with the unquestioned premise of a pre-given individual who may or may not be duped, and coming down on one side of the argument or other” (63). He shows the potential of approaching the issue of fetishism through psychoanalysis, which “acts transversally to this misleading opposition by refusing to begin with a pre-given subject. For psychoanalysis, the subject is constituted as much as it is constitutive and it is never fully present to itself” (63). This discussion then goes on to attack the core of consumerist logic, in which, as Zygmunt Bauman pointed out, “a satisfied consumer is neither motive nor purpose” (66) and at which “heart lies a fundamental contradiction between the promise of satisfaction and the persistence of unfulfilment, the proffering of pleasure and its withdrawal” (68). He then goes on to talk about the desire, which is created through the creation of something that the subject supposedly lacks – to repair this lack the subject has to go and shop – for Lacan desire is the metonymy of want-to-be. Clarke argues that the fundamental importance of fetishism lies in its “seductive potential, which relates purely to its form” (74) and so as Baudrillard puts it ‘fetishism is actually attached to the sign-object, the object eviscerated of its substance and history, and reduced to the state of marking a difference, epitomizing a whole system of differences (Baudrillard 1981: 93)’. “It is this characteristic that is responsible for the seductive power exerted by consumerism” (74). This chapter is all in all a great mixture of Marx, Lacan, Baudrillard and Bauman, and though this little tasting does not do it full due, I hope that it at least draw your attention to it. Baudrillard, J. 1981. For a Critique of the Political Economy of the Sign St. Louis Telos. Tereza Kuldova has written several book reviews for antropologi.info. Some of her recent ones are Lookism: Why we don’t want to be perceived as “ugly” or “different”, No fashion outside the “West"? and Religious globalization = Engaged cosmopolitanism? I would very much like to provide a link to your review on the Ashgate Blog, would this be acceptable? @Lorenz…What a great articulation…It is a very rich post! Thank you for spending time on working on it.